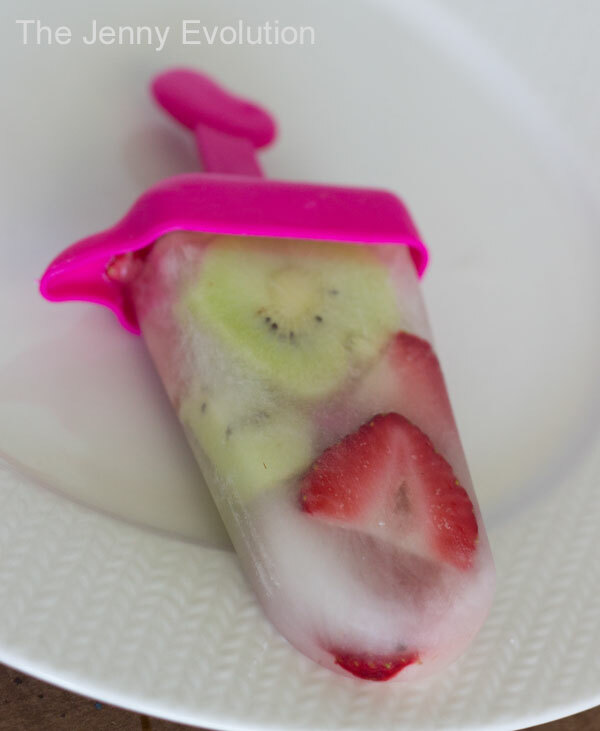 Do you love easy homemade popsicles? These cool treats can be made in minutes, without all the additives and preservatives of store bought versions! There is nothing like spending a lazy day by the pool cooling off with a refreshing ice pop. 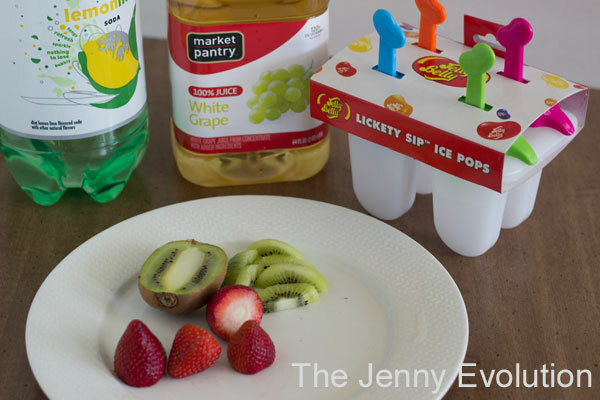 And Herchel (a favorite fellow blogger) from Gym Craft Laundry is starting off summer the right way by sharing her amazing homemade strawberry kiwi spritzer popsicle recipe with us. So get ready for summer! We make popsicles together all the time! My kids like to try new flavor combinations. I like to try healthier recipes. It’s a win win! Whether you like sweet and fruity popsicles or creamy fudge pops, homemade versions are easy to make and don’t take much time. I like to make pretty popsicles that look tastier than grocery store pops. Presentation is half of the experience, especially when it comes to children. 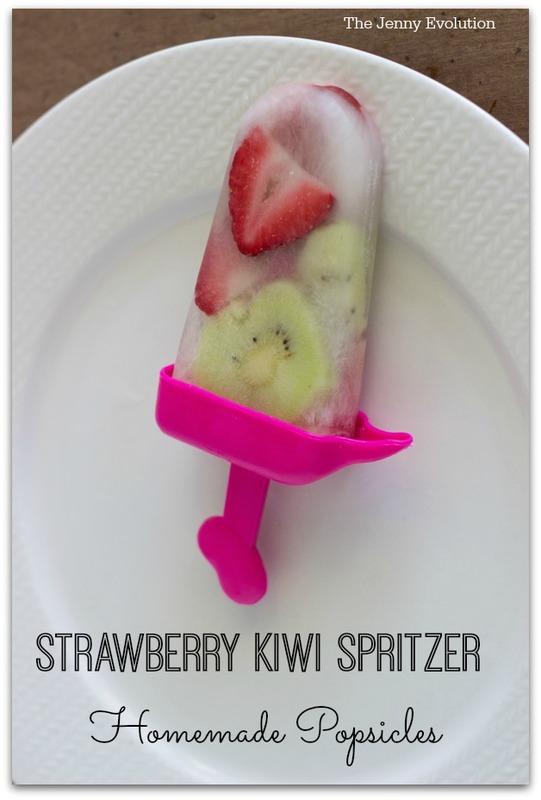 This time we went for a pretty strawberry kiwi spritzer popsicle. Slice your fruit into fairly thin pieces. Drop them into the popsicle molds. You can layer the strawberries with the kiwis or vary them like I did! Mix the white grape juice and the lemon-lime soda together. Pour over the fruit and freeze for approximately four hours. I originally tried this recipe with coconut water. While I love it in the coconut water, the kids didn’t find it sweet enough. Since we are kicking off the opening of pool season–which means the completion of my month long journey of getting the pool to turn from green to clear blue–we are celebrating with a refreshing treat so I gave in to the kid pressure. They really do taste better this way! These cool treats can be made in minutes, without all the additives and preservatives of store bought versions! I originally tried this recipe with coconut water. While I love it in the coconut water, the kids didn't find it sweet enough. Today’s guest blogger Herchel Scruggs lives in sunny Florida with her husband and two children. You can find her at Gym Craft Laundry where she shares parenting tips, kids crafts, recipes, her meandering fitness journey, and her attempts at homemaking. These popsicles look so yummy and they are so much better for you than store-bought ones. Thanks for sharing. I love her popsicles and this is sooooo smart! What a great way to sneak in extra fruit too! Love her popsicles, too! And so smart to get in those extra vitamins through the fruit. Will be making these for my kiddos this summer. These are such pretty popsicles! 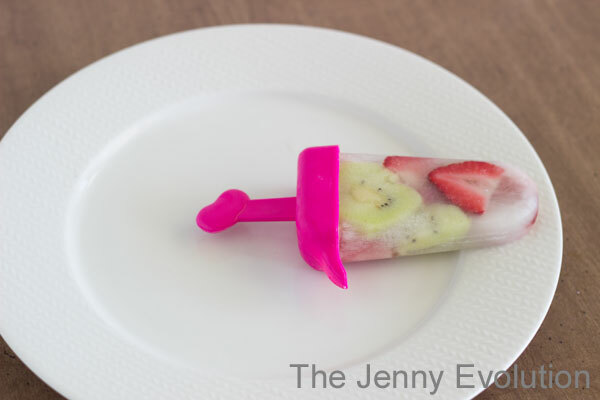 We have some new light saber popsicle molds I think these will be a great recipe for them! These look awesome! Thank you so much for sharing it! I’m going to make these for my grands this summer. Thank you for sharing the recipe. Yum! Yum. I really like the coconut water idea. My husband loves his popsicles. This could be just the fix. Looks so tasty! Thanks so much for sharing with us at Motivational Monday. Hope you will link up with us tonight! These look awesome. Popsicles are awesome. Thanks for posting. Hello from Turn It Up Tuesdays. And I thought I was pretty special with my freeze-juice-and-call-it-a-popsicle ice pops! lol! These look awesome! Time to up your game, Emma… and the thing is it really is easy 🙂 Happy eating! Hunh. 1/4 WHAT!?!? Cups. liters, ah … I give up. I’ll experiment, I guess. It’s 1/4 part white grape juice, 1/4 part lemon/lime soda. It really depends on how big your popsicle containers are and how much you are making. These look really yummy! Thanks for sharing on the What’s for Dinner Link up! Yum, these look beautiful and delicious! I have thought about getting some popsicle molds for my kids. I have heard there’s lots of great ways to turn them into secretly healthy treats for your kids! I worried they might be too hard to get out of the molds though…do you ever have this issue? Thanks for sharing at the Family Joy Linkup! Mmmm! These look and sound so fabulous and refreshing. I have got to make these! This looks delicious! I might make it with coconut water as you originally tried, for less sugar. thanks for linking your post up with us at the best of the blogosphere! Can’t wait to see what you have for us this week! I loved these so much I featured them on #TastyTuesdays this week. These are just gorgeous! I wish I would have had these through our days and days of 90 degree plus! Thanks for bringing these to Throwback Thursday! It was 107 yesterday & heating up today. Wishing I had these now! Thanks for sharing at the #InspirationSpotlight party. Shared See you again soon.